EFT - Emotional Freedom Technique or “Tapping” is a process of tapping, holding or massaging specific meridian points on the body, with the fingertips, in order to improve the flow of energy throughout the energy body. 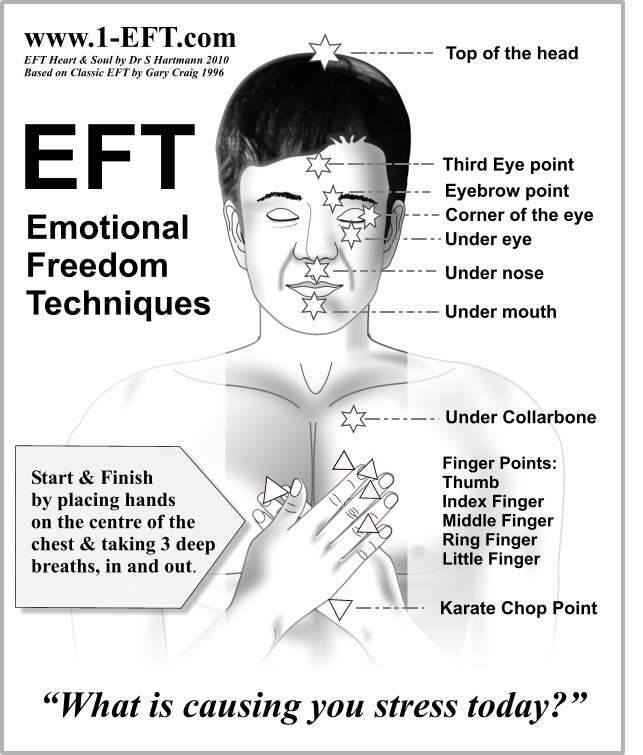 EFT is similar to acupressure (acupuncture without the needles). Sometimes, the flow of energy in our energy bodies can be blocked or disrupted. This can sometimes be due to an overload of energy in the form of strong emotions or trauma. Think of energy flowing, like electricity flowing freely around a light switch circuit. If the circuit is switched off (i.e. a light switch) at any place, the electricity does not flow continuously, therefore the light will not turn on. However, when that switch is re-connected (light switch turned on), the electricity flows freely around the circuit again, turning on the light. Optimal health and wellbeing is dependant on energy flowing freely and consistently throughout the entire body. EFT helps to increase energy flow and clear any energy blockages. How can EFT help me? EFT / Tapping is an easy technique to learn and can be learned by anyone including very young children. It is a very simple, effective and painless technique. Once learned, tapping can be used whenever and wherever you wish. When working with an EFT practitioner, you can learn how to specifically use tapping for your own personal challenges. Tapping can help you release emotions that are holding you back in life – you don’t re-live any traumas during a session – you simply connect with the feelings connected or associated with specific events and you release them through saying specific words whilst tapping on the specific points on the hand, head, face & collarbone. One of the biggest bonuses from working with a practitioner and learning how to use EFT effectively is that it puts you back in control of your life, giving you the power to heal yourself. The initial session takes approximately 90 minutes and costs €90 for adults (>18 years old). For teenagers (<18 years old) & children accompanied by an adult (parent or guardian) - session lengths vary with age & severity of presenting issue. Both the accompanying adult & teenager/child are taught the technique. Teenagers 90 minute session costs €60. Teenagers & children 60 minute session costs €45 & a 30 minute session costs €30. During this time, the EFT Master Practitioner will outline the structure of the session & briefly discuss the clients main focus. The client will be taught how to do EFT & will firstly use this new technique to de-stress and relax, bringing about a sense of calm and clarity to the session. Then the focus of the session can be discussed in greater detail in order to address specific issues. Once the technique has been learned, each specific issue can be addressed using EFT and deep breathing. The practitioner will then discuss using EFT at home and will give the client handouts (including detailed information & diagrams) and additional useful information. The session is then wrapped up by re-centering, booking the next session and doing a final round of energising EFT. Follow ups are normally scheduled for 1 week after the initial session & generally last for 6 – 8 sessions (depending on the client’s progress). These last 60 minutes & cost €60 per session for adults (>18 years old). If combined with Modern Stress Management or coaching, further sessions may last 90 minutes & cost €90 per session. Teenagers (<18 years old) & children 60 minute follow up sessions cost €45 & 30 minute follow up sessions cost €30. It is important to note that an EFT Master Practitioner does not diagnose or treat medical or mental health conditions. This is solely carried out by G.P.’s or other qualified doctors. EFT is not a substitute for medical or mental health treatments, but can complement most treatments that a client is receiving from their medical team. If necessary, a G.P. referral and/or collaboration may be requested, with client consent. Check in with your stress levels & do 3 rounds to de-stress first using a word(s) that resonate your feelings i.e. de-stress, relax, let go, calm, peace. Check in again to feel clearly what it is you want to work on & rate your emotion/feeling/pain on the SUE scale (Subjective Units of Experience number scale above). Your aim is to tap to move yourself up the minus side of the scale to 0 using your setup phrase & then to replace it with a positive to move yourself up to the plus side of the scale. Assume Heart Healing Posture (one palm on top of the other, where you would point to yourself on your chest) & take three deep breaths, in & out. Say the set up statement (words, emotions, colours, body parts, feelings that resonate with how & where or what you’re feeling) after each exhale. Start tapping/ touching/massaging the Top of the Head. Inhale as you tap & as you exhale say your “setup phrase”. Continue in the same way to the Third Eye point & all following points, breathing normally in between points. Return to the Heart Healing Posture for a moment of silent reflection. Take three deep breaths, in & out. This completes one round of EFT Heart & Soul. 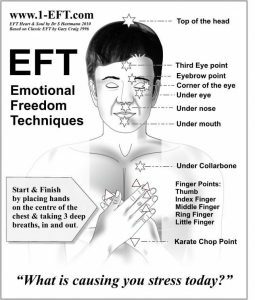 EFT was developed by Gary Craig, after he was trained by Dr. Roger Callahan in Thought Field Therapy (TFT). Dr. Callahan discovered TFT by accident in 1980 whilst trying to help a client to clear an intense water phobia with traditional therapy. This client had suffered badly from her fear of water. Dr. Callahan had seen little improvement in his client after using conventional methods. Dr. Callahan was sitting with his client, a few yards away from a swimming pool, when it occurred to him to ask the client to tap under her eye with her fingertips. He knew from his studies of the body’s energy system, that this point under the eye corresponded to the stomach meridian point in acupuncture. His client had been complaining of discomfort in her stomach. To Dr. Callahan’s astonishment, his client ran over to the pool, splashed water in her face and said that her water phobia was gone. Her phobia never returned and her associated symptoms disappeared. Encouraged by this, Dr. Callahan developed TFT. Gary Craig then took what he had learned with TFT and developed it into EFT – The Classic Protocol. This included all of the tapping meridian points into what he called “The Basic EFT Recipe”. Gary Craig developed “The Classic Protocol” which is still the original EFT protocol. This used a collection of approaches from different fields of research to bring about a change in the client's presenting problems. Gary made EFT tapping available to therapists in 1995 & he offered the EFT Handbook free to the public. EFT is the original modern energy treatment technique and many energy pioneers have further developed this technique in the energy field. One of these energy pioneers, Silvia Hartmann, introduced EFT to the U.K. & started the The Association for Meridian & Energy Therapies (The AMT) in 1998 with co-founder Chrissie Hardisty. The AMT was to be the original certifying body of professionally trained and insured EFT practitioners. Silvia Hartmann went on to develop further energy techniques including Energy EFT using the Heart & Soul Technique. This new technique evolved from the original Classical EFT Protocol, after 15 years of practical experience, along with other energy developments and a much greater understanding of how to work with energy successfully. In 2011, the AMT Trainers began training practitioners with the new Heart & Soul Protocol. The Heart & Soul Protocol is a simplified and easy flowing version of the original Classical EFT Protocol. It is specifically designed to be easy to teach to all ages, easy to use and easy to remember. It is applicable to the widest possible range of clients, whilst at the same time maximising energy effectiveness across the board.